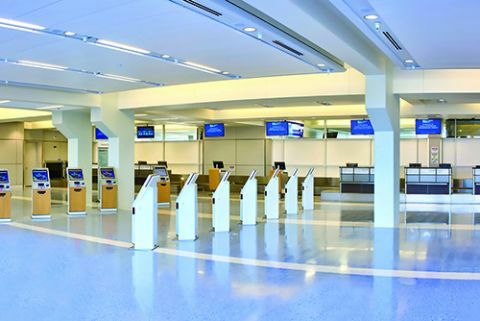 Dallas/Fort Worth International (DFW) celebrated another milestone of its $2.7 billion Terminal Renewal & Improvement Program (TRIP) in January, with the completion of renovations in Terminal A. The $650 million Terminal A project kicked off in 2011 and, like the entire capital program, centered around improving the customer experience. Terminal A now features an operational design that accommodates the current aircraft fleet, passenger volumes, current security mandates and the ever-increasing expectations of the traveling public, explains Khaled Naja, DFW's executive vice president of Infrastructure and Development. Although the overarching theme of the capital improvement program is enhancing the customer experience, various components address more specific goals such as cost and operational efficiency, enhancing security, increasing non-aeronautical revenue and empowering customers and employees. Like many other terminals throughout the country, DFW's Terminal A was "outdated and did not meet the needs of the modern traveler," Naja explains. Recent improvements, however, have completely renovated the more than 40-year-old facility. "We essentially gutted the entire terminal to the structural concrete and steel," says Naja, noting that one of the primary goals was to provide customers with a seamless travel process. "We want to make sure they benefit not just today, but in the future." Passenger flow was dramatically enhanced by turning the security checkpoints 90 degrees and expanding three of them by about 300%. The extra space made room for additional screening equipment and allowed for optimal configuration of equipment and queuing, he explains. Passenger recompose areas after the checkpoint were also expanded. Other notable Terminal A improvements include renovations in two baggage claim areas and more self-service check-in kiosks. On the airside, 26 gates were renovated. The Terminal A renovation creates a more flexible facility, Naja relates-both in terms of technology and physical layout. For example, when TRIP kicked off, American Airlines was flying turboprop aircraft, which have since been replaced by regional jets. 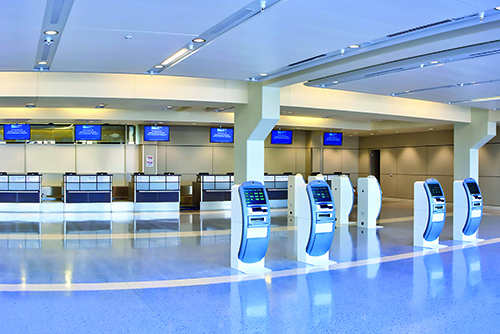 During the Terminal A renovation, the airport reallocated holdrooms, restrooms and concessions space to accommodate the increased volume of passengers arriving on American's new fleet. Changes were also made on the ramp to accommodate regional jets. Moving non-critical, non-operational support spaces off the concourse level provides additional flexibility with the terminal. In the future, the airport can change the function of these spaces without incurring the inconveniences associated with rebuilding them. Non-critical functions removed from the concourse level were relocated to the ramp and mezzanine levels. On the technology side, DFW upgraded to a centralized technology "backbone" to support the technology infrastructure within Terminal A. Redundant power feeds will allow critical systems to maintain operation even if the facility loses electricity during lightning storms. Overall, DFW has built or rebuilt more than 150 concessions throughout TRIP. Terminal A's renovation allowed for 50% more concessions space. "We kept what was working very well, and we also introduced new [concepts] that our customers were demanding," says Naja. Cynthia Vega, DFW's manager of corporate communications, reports that Terminal A now feels lighter, brighter and more spacious. Open concept retail and food/beverage offerings, as well as café-style seating where travelers can keep an eye on their gates, have transformed the concessions areas. The mix of retail and food/beverage offerings reflects DFW's efforts to really know its travelers and meet their needs, she adds. "We want to highlight and bring to life the best of what Southwestern charm brings to the table, and at the same time, bring in international cuisine so we have a broad spectrum of offerings." Because today's passengers must allow more time for security screening, they often have more time on their hands after clearing TSA checkpoints. "People want to resume their lives," Vega explains. "They're spending every minute valuably, and they want to continue their lives while in the terminal. We respect that and what you'll see in this [concessions] program reflects that." New dining options in Terminal A include The Salt Lick Barbecue, Dallas Cowboys Club, Lorena Garcia Tapas y Cocina and Ling & Louie's Asian fusion restaurant. New retail offerings include Tumi, iStore, Teavana and Gepetto's Toy Store. To further meet traveler needs, the airport added a food ordering option to its mobile application in mid-July. Now, customers can order from 26 restaurants through the DFW app. "We recognize that our airport is bigger than the island of Manhattan, and that can be a little overwhelming," Vega relates. The opportunity to order food ahead helps ease some of the stress travelers might feel when beginning or ending their journey at the large airport. Naja notes that DFW is improving concessions offerings and the way it engages customers. "It's the best experience you can have at an airport," he states. At more than 40 years old, Terminal A required mechanical, electrical and plumbing upgrades throughout. All systems were replaced with more energy-efficient options, which helped DFW achieve carbon neutrality for the year. Other environmentally conscious aspects of the renovation include an energy-efficient window wall system, a building automation system to control temperature and a daylight harvesting system that balances the amount of natural and artificial light. "Sustainability is something we take very seriously at DFW," Naja says. "We believe in being fiscally responsible and a steward of the environment." A strict recycling and waste separation program that covers all TRIP endeavors yielded environmental and financial benefits during the Terminal A project. Renovating approximately 3 million square feet of terminal space creates a lot of waste, comments one project official. In total, TRIP's proactive recycling and waste separation program has diverted more than 180,000 tons of material from going to landfills. As part of the larger TRIP initiative, Terminal A renovations included holistic enhancements to static and digital signage. "We took down every little sign, evaluated every little requirement and reestablished all signage throughout terminals A, B and E," reports Naja. The project team focused on community engagement, working closely with American Airlines and a "very active" wayfinding program to reduce confusion for passengers throughout the renovation process. Every morning and night, personnel would navigate through the airport to ensure that the right signs were in place, and that they were clean and visible. DFW also dispatched public safety department personnel at pinch points to help people move through areas of congestion as they developed. Careful and controlled phasing of construction activity was critical to minimize the impact renovations had on operations. One project executive referred to the difficult phasing process as an art. The project team worked with airline partners, primarily American Airlines, to outline multiple work phases and establish restrictions on the maximum number of gates that could be closed at any one time. Using those parameters, renovations proceeded through the terminal in a set order, with project officials keeping an eye on the balance of facilities that were open and operational to support the needs of airlines and customers. Much of the construction work was completed in off-hours, to prevent it from encroaching on passengers and airline operations. According to traffic estimates, the equivalent of the entire population of Fort Worth traveled through DFW's construction site every week during the renovation project. On an annual basis, the airport serves 65 million passengers. So keeping the busy terminal operating while crews ripped out the building systems and replaced infrastructure created challenging logistics. Like the work inside the terminal, material movement was scheduled to minimize disruptions. Construction waste and debris was hauled away after hours to reduce the number of vehicles on the roadway with passenger traffic. "The airport almost came alive again in the middle of the night with all the construction activities and deliveries that would take place," recalls one former project official. Right on the heels of the Terminal A renovation, DFW was voted No. 1 in customer service for large airports in North America, according to Airports Council International. "It's very visible that we listened to the customers, we adjusted to their needs and exceeded their expectations," relates Naja. Vega notes that the airport is "constantly talking to customers-doing research and asking them what they need and want and what will make their experience better." DFW staff members routinely survey customers throughout all five terminals for feedback and suggestions. As the airport planned the Terminal A renovation, it sought input from customers about specific elements such as power outlets, generally a hot-button topic for travelers. To determine the best option for its customers, the airport asked five industry vendors to install their best products in a demonstration holdroom. Passengers were able to "test drive" the various options and vote for the one they wanted to see at DFW. The airport's marketing team prepared a survey and used an outside agency to conduct an independent survey for the seating power selection feedback, Vega explains. Not surprisingly, the No. 1 thing DFW passengers wanted in charging options was quantity. These days, it seems like everyone wants to plug in a phone, laptop or e-reader to charge while they wait. Options that prevented passengers from huddling around outlets along corridor walls or climbing over one another to plug in were high priorities. 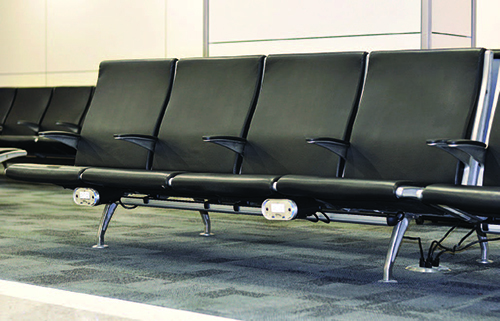 Based on customer input, the airport selected Arconas seating with built-in power outlets and USB ports. According to Naja, active and early involvement from airline partners, 22 different airport departments and other stakeholders helped drive the success of the Terminal A renovation. "We've put in over 17 million man hours of construction labor on the program," he reflects. "That is a significant volume of people that have contributed over the last five years, very safely and with great results." In other TRIP news, the airport's Terminal E renovation reached substantial completion in mid-July, and airport officials expect the Terminal B renovation to be completed by year's end. A three-level parking garage project for Terminal A, also part of TRIP, was completed in 2015 for $176 million. (See our May/June 2015 issue for more details.) Developed in conjunction with its airline partners, TRIP is designed to improve DFW's aging infrastructure and allow the airport the flexibility to respond to changes in the aviation industry.